It's called an "energy tower," or in the words of Forbes, an "energy skyscraper:" A massively tall hollow concrete structure situated in a warm, arid climate. The sun's rays super-heat the top of the tower, and a cool mist gets sprayed across. The water evaporates and the cool, heavy air is then sucked down into the base at speeds of up to 50 miles per hour. At the bottom, the whooshing gusts of air push through a circle of wind turbines—producing energy. Solar Wind, which is based in Maryland, wants to start construction on the first major energy tower in the country, in San Luis, Arizona, by 2018. The town of 26,000 has also agreed to sell the company the water it needs to continually spray a fine mist over the 1,200-foot wide top of the tower. This mega-structure will sit on a 600-acre piece of desert near the Mexican border where the temperatures regularly reach 106 degrees—perfect for the technology, which relies on hot, dry climates. We ran some calculations and found that, theoretically, we'd get out eight times the energy we put in to pump the water to the top of the chimney. But, in 1965, there didn't seem to be any need for new energy sources. Carlson did patent the concept in 1975, but it seems the idea was tabled. Since then, two engineers named Professor Dan Zaslavsky and Dr. Rami Guetta from Technion-Israel Institute of Technology have resurrected the idea, studying it extensively and publishing a number of papers on the topic. So, why isn't the American Southwest dotted with 2,000-foot-high energy towers? First of all, there are considerable challenges involved in actually building them—including not only funding the construction of such a huge tower, but also the cost of pumping water up to the top at a constant rate. 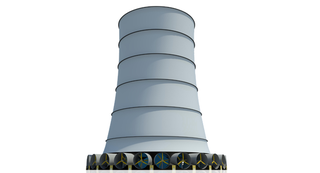 Building Solar Wind's tower, in Arizona, will require $1.5 billion in capital, according to Businessweek. In Arizona you do get a lot of dreamers who say, 'You could really do something with this.' With (Solar Wind Energy), they have already gotten permission and concurrence from federal agencies in Washington. They weren't starting with the Air Force, they weren't starting with BLM. They were starting at the top. It isn't a guarantee of success, but it is a lot more feasible than a lot of the other things I've seen. The deal with San Luis no doubt hinges on the fact that the construction and upkeep of the tower would bring thousands of jobs to the area—not to mention producing 1,200 megawatt-hours of power in the hotted, driest months.